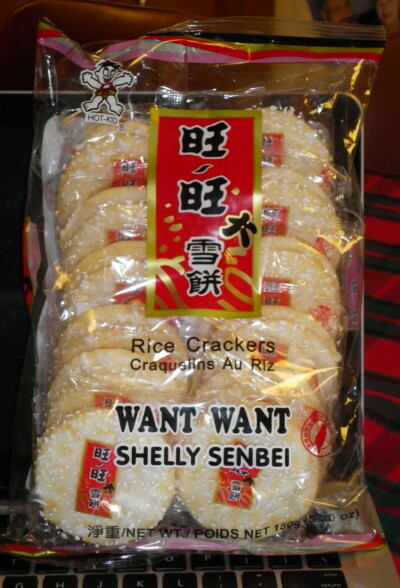 Here is the other flavor of senbai from Hot Kid which is, as best as I can tell, plain rice cracker. 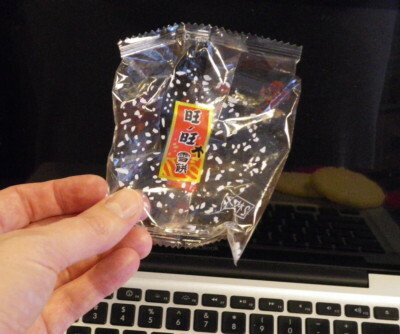 It too has a little more depth than other rice crackers I’ve had, perhaps a bit of wheaty and definitely a little more salt. I like the roundness that comes from these additions but without the spicy flavor of the previous crackers these come off a bit…bland. You can see that they are frosted with sweet which gives a third flavor to go with the ricey, hint of wheaty and a touch of salty. I’m not sure I’d have gone with sweet per se but it is an interesting choice. Certainly these senbei have the most character of any rice cracker I’ve had but the Guinea Pigs and I are divided on the rating. One likened these to frosted cardboard, one would eat them if she was starving but not so much voluntarily, one solidly liked them and I’d eat them casually. This does not bode well for figuring out a rating. I think the spicy flavor were better crackers but these are tasty in that category of bland rice crackers. 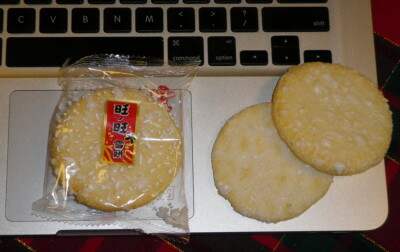 The American palate might prefer a Ritz or a Club cracker to be sure but in the sea of all rice crackers, these are pretty tasty. Because my Pigs were so diverse in their reactions, I’m going to give these an average rating and a caveat that if you don’t like rice crackers, these are probably not tasty. I forgot to mention the odd packaging…frosting dots printed on the wrapper. Odd. Rating of 3 wasabi peas out of a possible 5 wasabi peas.